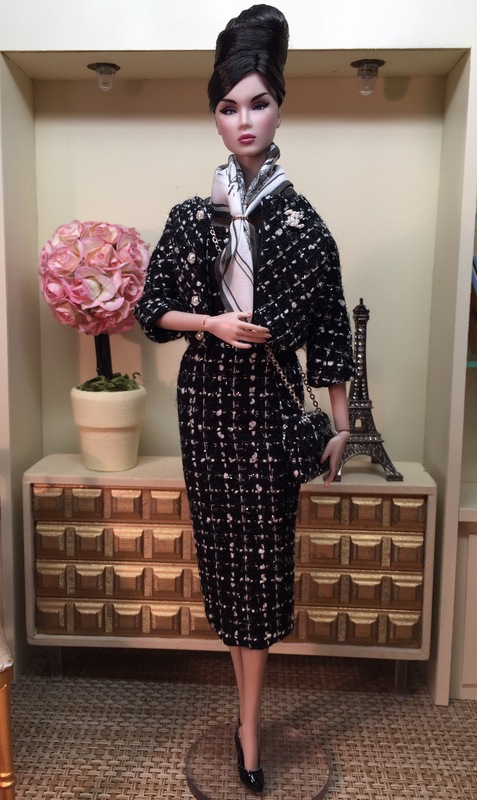 As the holiday season approaches, a perfect party ensemble is a must in every woman’s wardrobe. 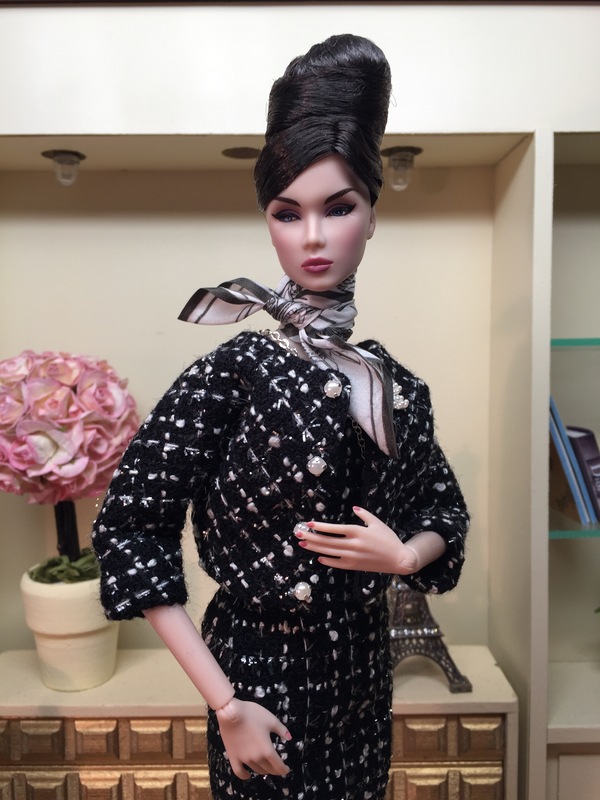 This ensemble is all in black, but has a variety of textures and pops of sparkle that make it very versatile. The slim, strapless sheath is made from a black crepe with a subtle stretch for a perfect fit. The top of the bodice has a band of textured stretch chiffon with a shiny, fuzzy texture and tiny black sequins for sparkle. 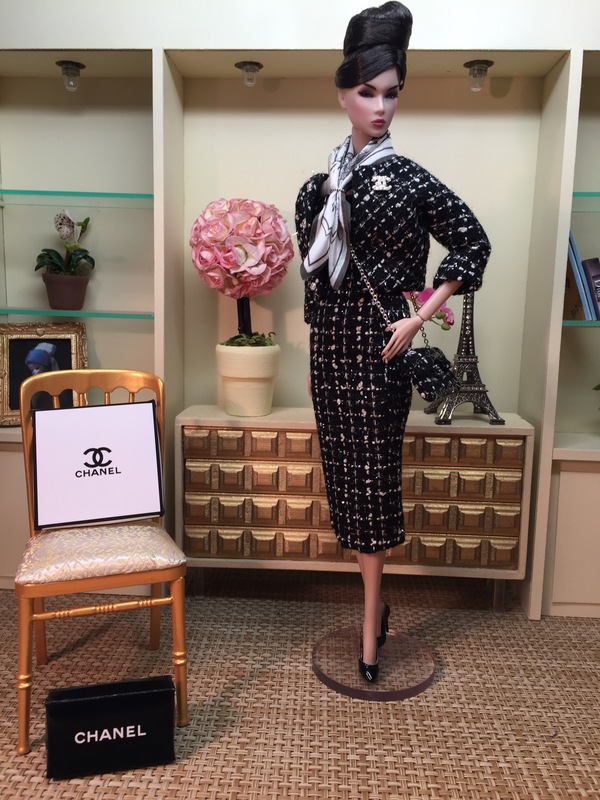 This same fabric makes up the boxy jacket, with 3/4 length sleeves and fully lined in black silk taffeta. 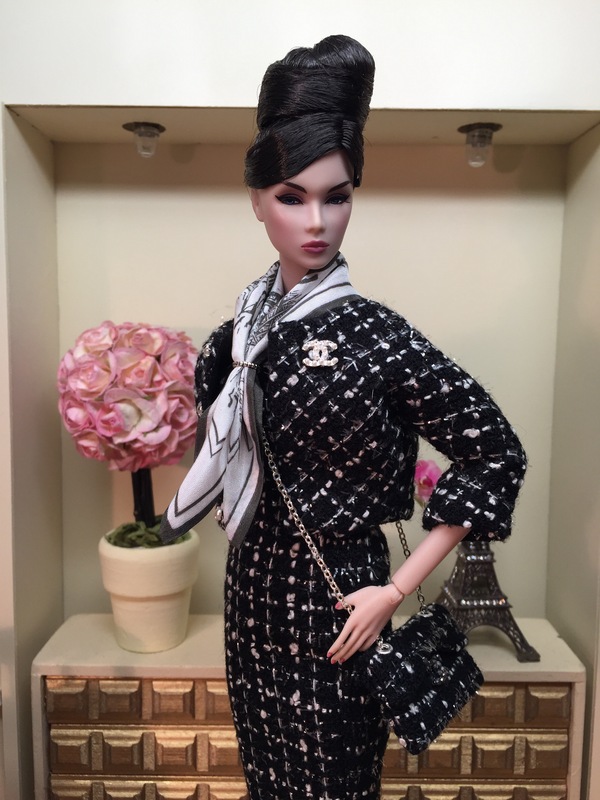 Also included with this ensemble are 3 Chanel logo brooches that can be mixed and matched with this ensemble or with other fashions in your doll wardrobe. Each brooch is magnetized and can be placed where you wish. 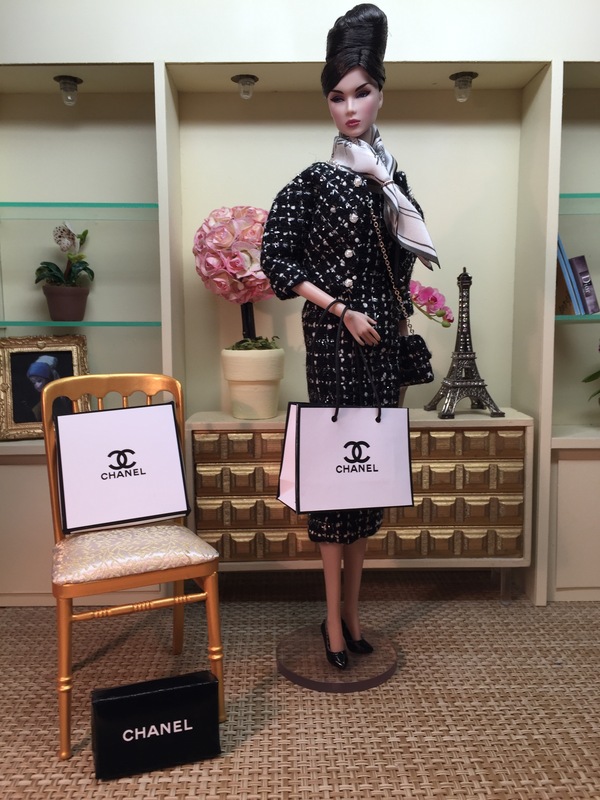 Finally, a Chanel Signature shopping bag from Inside the Fashion Doll Studio is included. As Autumn progresses, the air is filled with falling leaves in yellow, orange, and red. 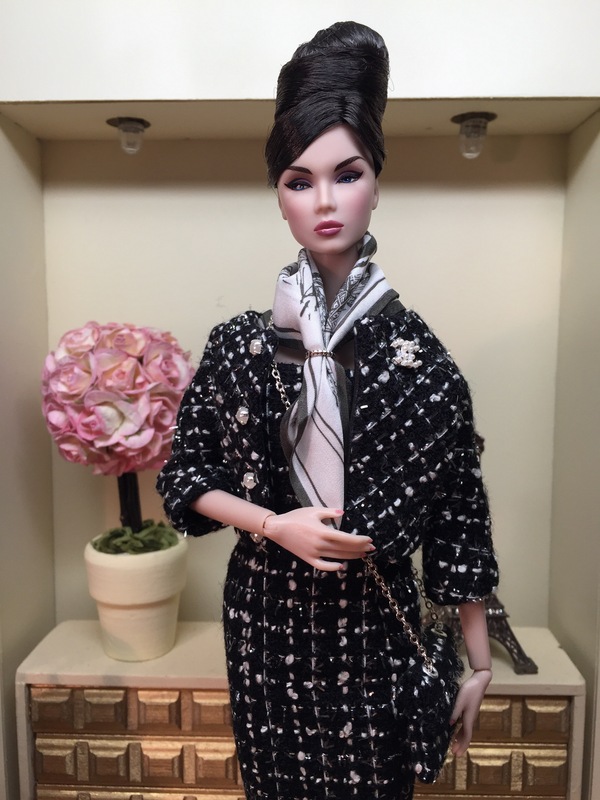 This beautiful scarf, made by Inside the Fashion Doll Studio, is pure silk and depicts an authentic design by French luxury fashion house Hermès. The design is a whirling vortex of colorful Autumn leaves. Also included is a gold scarf ring and an Hermès signature box for storage. 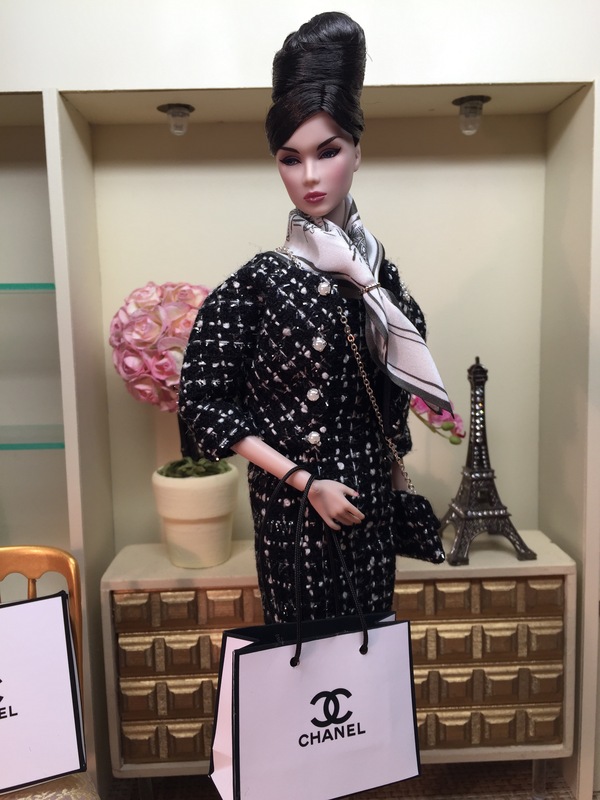 The shopping bag shown is not included, but can be purchased directly from Inside the Fashion Doll Studio. The accompanying sheath is made from a dark red silk noil, which has a nubby texture similar to linen. The sheath has a split collar detail at the neckline.